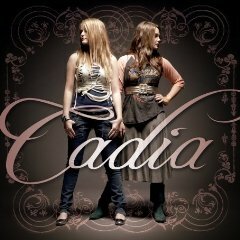 Cadia is a derivative of the ancient Greek word Arcadia meaning ‘a place of peace.’ Long time friends Tori and Courtney have banded together to create just such an atmosphere on their debut, self-titled CD. Setting precedent with their recent groundbreaking video Inside Out, the official theme song and video for Women of Faith’s “Revolve Tour,” the two are making good on their resolution to encourage young women toward establishing identity in Christ. The album delivers high-energy pop/rock, chock full of catchy hooks, insightful lyrics, and insanely singable melodies. Their music crosses traditional boundaries of age and gender, appealing to teenyboppers, rock ‘n’ rollers, schoolboys, and grandmas alike, they have a special heart for girls in their middle school through college years. Those years are crucial in shaping one’s future self-image and well-being, a time when young girls most need to be reminded of Christ’s unconditional love.